How Many Monitors Does It Take to Make a CFD Mesh? 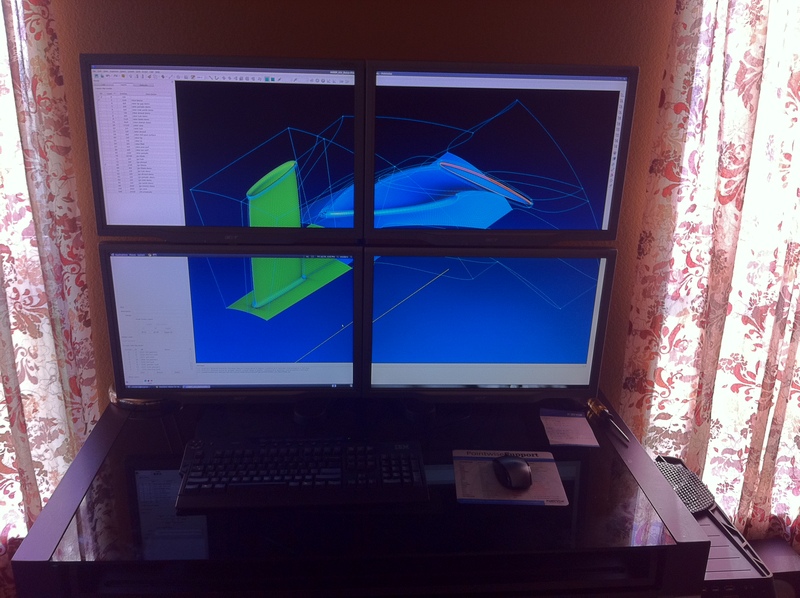 Taking the meaning of large CFD meshes in a completely new direction, someone at Pointwise created this 4-monitor setup at home for running Pointwise at 3,200 x 2,100 pixel resolution. It seems like nearly everyone has a 2-monitor setup these days (except me – I use a 15 inch laptop). If you have cool multi-monitor setup, send a photo of it with Pointwise running and I’ll post it here. Email your photo to blog@pointwise.com. This entry was posted in Hardware, Off Topic and tagged display, monitors, Pointwise. Bookmark the permalink. 2 Responses to How Many Monitors Does It Take to Make a CFD Mesh? impressive setup… seems it is a linux box running the gnome 3 which specs? how much ram? hard drives?? ATI or Nvidia GPU? It runs Ubuntu 10.10 (64-bit) which I believe uses Gnome 2.32. The displays are powered by two Nvidia GeForce GTX 260 video cards each with two DVI ports. To configure four displays in a unified desktop you need to configure each screen with its own Xserver and then use Xinerama to stitch and orient them all together. I did it by hand in the xorg.conf but you can use the nvidia-settings GUI as well. Computer specs: Intel Core i7 820 (@3.5Ghz), 8GB RAM, 2 x Nvidia GeForce Gtx 260 (w/ 768MB RAM) and 1TB hard disk.